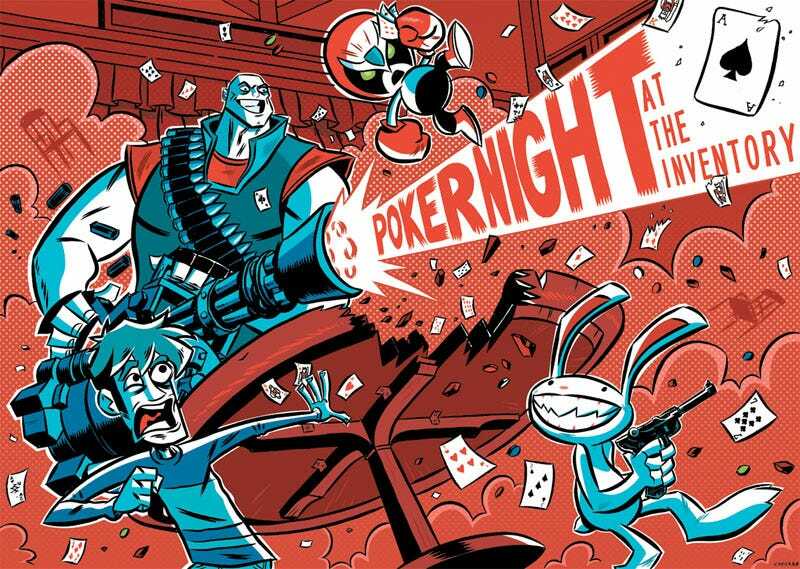 Telltale Games' tease that featured a cryptic crossover between Homestar Runner, Penny Arcade, Sam & Max and Team Fortress 2 turns out to be the developer's latest gambling game, Poker Night at The Inventory. Yeah. The Heavy, Strong Bad, Tycho and Max the "hyperkinetic rabbity thing" will play what Telltale calls "a new style of poker" in Poker Night at The Inventory, which hits the PC and Mac for $4.99 USD this fall. "We've had the idea for some time of exploring the idea of what video characters do when they're not ‘on the clock' in the games we play," explained Telltale CEO Dan Connors via the game's announcement. "We pitched the idea to friends in the industry and it really resonated. We all had a great time imagining what these guys would banter about while slinging cards – from there Poker Night at The Inventory was born." The Steamworks-powered game has "more than a few surprises" still up its sleeve, according to its creators. Telltale Games will be attending this weekend's PAX convention in Seattle, Washington, takin' pre-orders and handing out Poker Night at The Inventory posters. Bring an extra fiver!